On 29 Dec, Beijing --- Themed “In China, Be Together”, WWF China celebrated its 35th anniversary to commemorate its 35 years of conservation work in China. Together with partners, WWF reviewed its major work and achievements in the past 35 years. In addition, this anniversary also witnessed the opening of “WWF China 35th Anniversary---Giant Panda Public Art Tour”. At the end of 1970s, Sichuan province suffered a large scale of arrow bamboo flowering, which greatly threatened giant pandas’ survival. In 1980, invited by Chinese government, WWF sent several international experts in species conservation to the habitat of giant pandas in Sichuan province to help local government conduct conservation work of them, making it the first international non-governmental organization started field conservation work in China. Over the past 35 years, starting from protecting giant pandas, WWF has extended its conservation programs to fields like species protection, freshwater and marine ecosystem protection and sustainable utilization, forest conservation and sustainable management, education for sustainable development, climate change and energy, wildlife trade, scientific development and international policy and so on. Rooted in China, WWF conducted its work in broad regions in China, ranging from the vast forest areas in the northeast to the lofty mountains in the southwest, from the coast of East China Sea to the source of Yangtze River. With close cooperation and joint efforts with both central and local governments, scientific research institutions, NGOs, partners in business, WWF has promoted the process of sustainable development in China. Over the past 35 years, WWF has assisted more than 2.6 million hectares of forests in obtaining certificates for sustainable development; offered policy advice in a wide range of areas including climate, energy, sustainable finance and ecological footprint; promoted the construction of numerous natural conservation areas, saving Amur tigers, pandas, elks, cowfish and many other endangered species; pushed forward the implementation of various environmental standards, including MSC, ASC and FSC, helping companies to produce and operate sustainably through some WWF projects like Water Stewardship, Climate Savers as well as Global Forest & Trade Network (GFTN); and expanded project influence of Earth Hour, Awareness Week of Sustainable Consumption and other public activities in China, so as to improve people’s environmental consciousness. 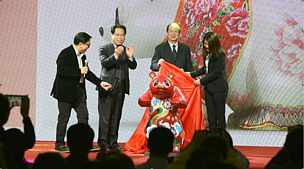 Moreover, in the celebration, WWF Director Lo Sze Ping, the founder of Heart Panda, Ms. Chen Mimi and other partners, jointly unveiled the Exhibition Tour of Panda Public Art for the 35th Anniversary of WWF in China. Heart Panda carefully selected 9 artistic pandas of different distinctive styles from over 200 artworks. The exhibition now has been held in Berlin, Shanghai and Hong Kong. And the artworks it exhibited come from the creativeness of different people, including celebrities, artists, students and crafts-inheritor, showing their love for panda. “Artistic creations made by Heart Panda are based on panda, and the first project WWF conducted when entering China is about giant panda protection. It’s like we are destined to be brought together. Art and environmental protection are correlated, and we hope that by way of public itinerant exhibition like Heart Panda more attention to environmental protection would be aroused”, said Ms. Chen Mimi. According to the Fourth National Giant Panda Research whose result was released in February, 2015, the number of wild giant pandas in China reached 1864 which increased by 268, or 16.8%, compared with that of 2003. As a part of celebration for the 35th anniversary of WWF’s entering China, Heart Panda specially made 1864 charmingly cute pandas which would be exhibited in many cities, to celebrate the achievements China has made on giant panda protection and to evoke public’s awareness on ecology protecion. As the biggest panda culture institute of public artificial activities, Heart Panda is not only working on protecting the disappearing traditional cultures and skills, but also cultivating long-term vitality for Chinese new artistic power. Heart Panda chooses one city from all over the world to hold activity every year. It takes panda as creation medium and appeals new generations to make its voice heard by the world. It discusses the collision of traditional culture and new culture, pursues the power of love. In the year 2014, Heart Panda visited many of China's top art colleges and universities to collect creative works, which received active response. More than 3000 creative works were gathered, from Tsinghua University, Fudan University, Zhejiang University, Shanghai University of Finance and Economics, China Central Academy of Fine Arts, Tianjin Academy of Fine Arts, China Academy of Art, Xi'an Academy of Fine Arts and Nanjing University of the Arts, etc... At the same time, sincere invitations were issued to Chinese celebrities, actors, young artists, continuators of non-material culture heritage and designers of different areas. Up to now, nearly 200 works has stood out, becoming the backbone of the 2015 Heart Panda Public Art World Tour. 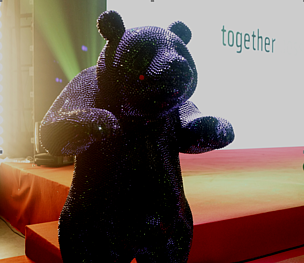 The Heart Panda Public Art World Tour has been successfully held in Berlin, Shanghai, Hong Kong and other cities. For more information, please visit www.heartpanda.org.